Way back on February 18th I wrote a post I titled “Look what the Rain Dragged In.” (You can see it here: http://womaninthemid.com/2013/02/18/look-what-the-rain-dragged-in/) It was about the time I wandered into my bedroom and found an earthworm on the carpet, obviously trying to escape the rain that we were were getting at that time. People, I just don’t need to know about the worms in your life. Worms in your carpet? Yuck! Worms in your cat? Eeek! Worms dangling in your room? Call the exterminator! And if you google anything about these subjects, don’t click on the Woman in the Middle Link. There is nothing for you here other than a lost earthworm. Really. Be forewarned, this is a PG-13 post. Not because of anything I did…but you will see what I mean if you choose to read on…. I thought that the craziest thing that would ever happen to me in a dollar store happened when the lady showed me her bra. Well, I was wrong. I don’t know what it is about dollar stores and crazy that seeks me out, but it does. Friday I stopped to pick up a couple more things I needed for a bridal shower I was throwing last weekend. A lady got in line behind me and after I put my things on the checkout stand belt she said “You need to look at my nails.” Being the nice person that I am I did. Imagine my surprise when I realized that each and every one of her long nails had been painted with stylized male genitalia in red and black. “Do you know what that is?” she asked. “Oh yes I do,” I replied. I love a good deviled egg and I make pretty good ones, if I do say so myself. However, the boiling and peeling of so many eggs is not my favorite thing. Which is probably why my deviled egg making has dropped off in recent (and not so recent) years. Well, folks, I bought something amazing this week. Hard boiled eggs that are all ready peeled. With thoses little guys in my kitchen I made 36 deviled eggs in less than 45 minutes! I was like a deviled egg making machine! I could have made HUNDREDS of those little devlis (so to speak)! My other discovery that really helped the process along was putting the yoke mixture in a plastic bag and cutting off the tip. So neat, so easy, and something you all already probably knew. But I had never tried it myself. By the way, all I put in my deviled eggs is mayonaise, mustard, and sweet pickle relish. So good! 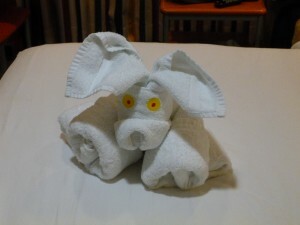 Have you been on a cruise? If so then you know about towel animals. The stewards who make up your room leave you a little surprise each evening – an animal made out of a towel. For some reason, Hubby and I take particular delight in our towel animals. We take pictures of them. We put them on our shelves. They amuse us! 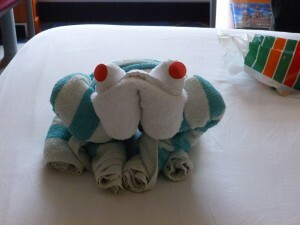 A frog, using a pool towel. An anteater, or maybe an armadillo? 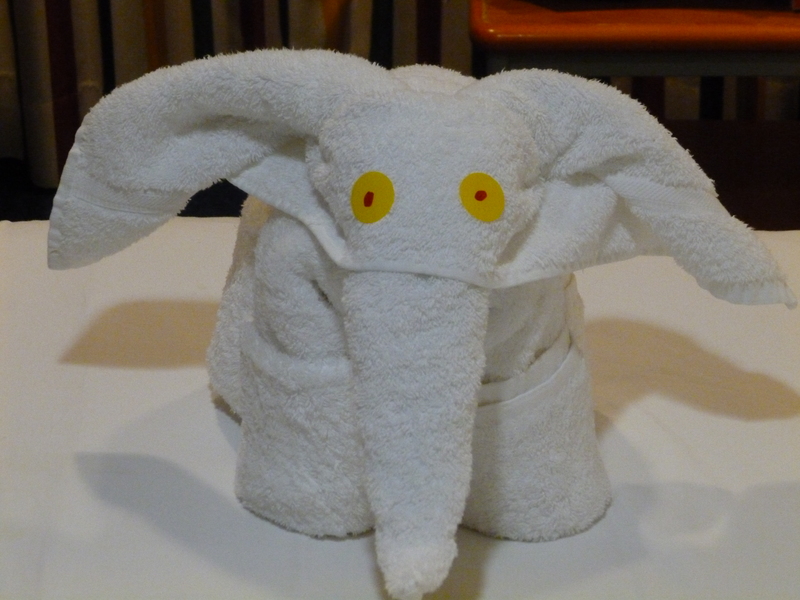 An elephant. 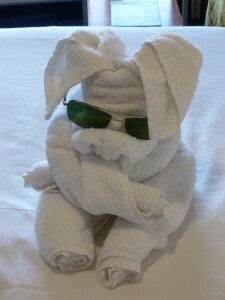 Isn’t he adorable? This pig has an attitude, probably because he is wearing Hubby’s spiffy sunglasses, which were bought in Germany. There is always one that leaves you a little puzzled. We decided this one was a penguin. 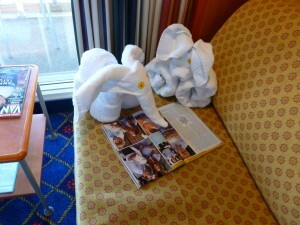 When the tourists are away the towel animals will play! 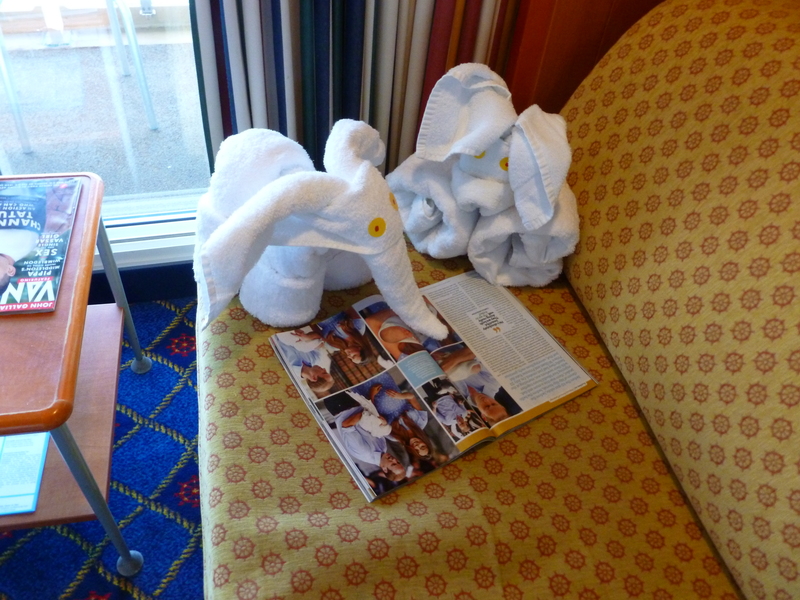 The dog and the elephant read a magazine on our couch. 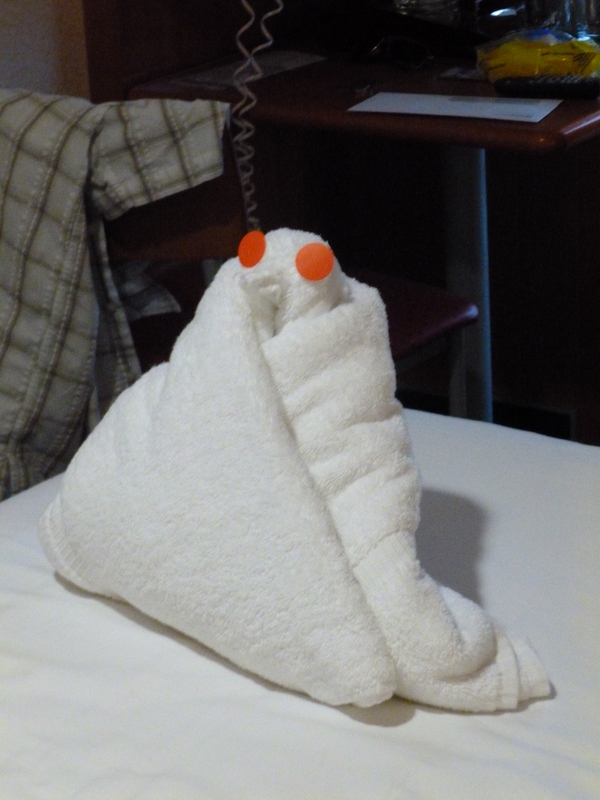 We hope this got a chuckle out of our steward. When Hubby and I spent a recent 21 hours in Las Vegas with Big Bro, something came up that required us to make a quick dash to a local drug store. We had no idea where one was that we could drive to so we decided to just walk to the nearest one on the Strip (otherwise known as Las Vegas Boulevard). For those of you who have never been to Las Vegas, the Strip, where most of the big casinos are located, is everything you expect and hear that Las Vegas is. Even on a Sunday night there were tons of people out on the sidewalks, many toting huge plastic cups of alcoholic beverages. People in various costumes were standing around, trying to convince gullible and drunk tourists to take a photo with them for a fee. Given the amount of alcohol floating around, I assume this can be lucrative. 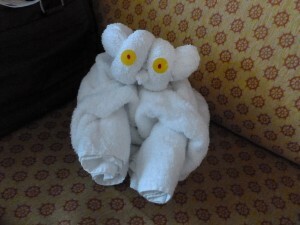 But even in the Sodom and Gomorrah that is Las Vegas, some things can go a little too far…. Even in Vegas, nakedness on the sidewalk was a little too much for the crowd to bear.There these girls stood, trying to look like show girls, and even the men were just giving them sideways looks and not stopping for a photo shoot. Imagine trying to explain that photo to the wife back in Des Moines? Sorry folks, I didn’t get a photo for this blog either. But it was certainly a funny exercise in people watching to see everyone’s reaction on that sidewalk in Vegas. He had to wait 10 years for a sibling to come along and them he got me, a prissy little girl who rarely got in trouble. No fun for him! Here is hoping that almost 52 years later Big Bro thinks he got an OK bargain when he got me. I think he does. This past Sunday we made a mad dash to Las Vegas. Big Bro had expressed a desire to see the magicians Penn and Teller. Sunday night we took in the show and it was great. We got good seats and Hubby and I sat Big Bro on the aisle. He got to be a minor participant in one of the tricks and when the show was over and Teller ran up our aisle Big Bro stuck out his hand and Teller shook it. Yay! We were glad we were able to help Big Bro with a bucket list item. Next he says he wants to parachute out of an airplane. A prissy sister can only be expected to do so much and I can’t imagine making arrangements to toss my only brother out of a plane! But that is OK, Big Bro knows someone who has done it recently, so he can make it happen if he wants to. If he does decide to jump, I will be there (on the ground) with the video camera like the good prissy sister that I am! 1. Enjoying my mug collection – In a desperate bid to clear out my airways and stop my coughing I am drinking lots of hot tea. After a long hot summer of avoiding hot beverages, I am once again enjoying all of my favorite mugs, and I do mean all of them. 2. Keeping my kidneys healthy - All of that liquid is keeping my kidneys active and happy. At least something in my body is active and happy. 3. I can eat whatever I want - When you feel awful, it is very easy to justify eating anything you want. So I do. Powdered sugar donuts, anyone? 4. Reading – I am really catching up on my reading. Normally this would be a fantastic thing. In this case, I have to admit I could give up some of the reading if it meant I would feel better. 5. No one thinks you are lying when you say you are sick – I sound awful. When I called less than 48 hours before arrival to cancel a reservation, they actually refunded my money. When I said I had gotten deathly ill and was unable to travel they believed me. 6. Postponing the flu shot – When I went to my local medical clinic it was flu shot day. But when I asked the nurse practitioner I was seeing if I should go ahead and get it she said I should wait, I was too sick. Maybe I should have gotten that flu shot a little earlier…. 7. When this is all over, I am going to look smart – Given how out of it I have been, when this is all over I am going to seem much more with it and smart. 8. You discover new features on your television - Our TV has a power saving feature that I never knew about. If it doesn’t sense movement in the room it turns off the picture while allowing the sound to continue. Maybe I had been laying on the couch too long without moving? I am happy to report that the visit to the nurse seemed to have helped and I am finally on the mend. At least rock bottom is now behind me and I am on an upward trajectory! To take my mind off my lingering illness, I thought back to my recent vacation and …brides…. You are probably wondering how vacation and brides came together in my mind. I swear I wasn’t delirious! When Hubby and I were on our trip we happened to be in St. Petersburg Russia on a Friday, and Saturday. It just so happens that those are the most popular days of the week to get married there. 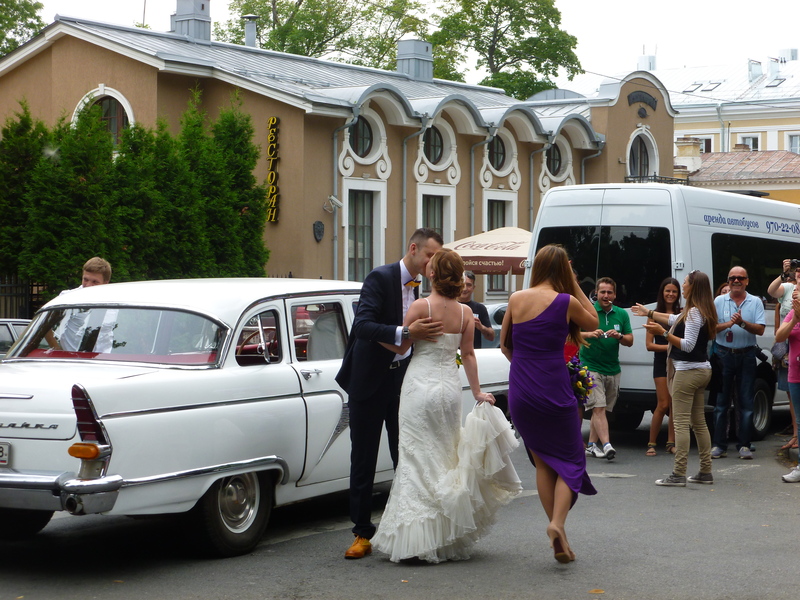 When we came out of Catherine’s Palace we happened to see a bride and groom, along with a photographer and what looked to be their maid of honor and best man. All the women in the tour group of course went ooh and ahh and I snapped a photo of the happy couple. Little did we know that this was just our first bride in a long succession of brides we saw on our two-day visit. According to our tour guide, it is a Russian tradition to have a small civil ceremony at the local registry office (otherwise known as the wedding palace). Then the bride and groom hop into a car of some sort and drive around the city drinking vodka. As you can see from my photo, this couple rented a classic American car. We also saw limos and even a Hummer. They stop at all the scenic/historic sites in the city where their photographer takes their photo. Eventually, exhausted and snockered I presume, they head to a restaurant they have hired for a reception and meet up with their family and friends for the wedding reception. As tourists, it was our main objective to drive around and see all the scenic/historic places in and around St. Petersburg, kind of like the wedding couples but without the white dress and with a very limited amount of vodka. Since we were there on the days of the week most popular for weddings, we saw lots, and I do mean LOTS, of brides and grooms. I saw more brides those two days then I do in 20 years back home. Sometimes we even saw more than one couple jockeying for position in front of a particular monument. It was a fun little window into the real lives of actual Russians. I think I have the plague, folks. At least that is what it feels like. I haven’t had this bad of a cold, flu, whatever it is, in a very long time. Even Hubby mentioned last night that I haven’t coughed like this in a long time. Oh goody. 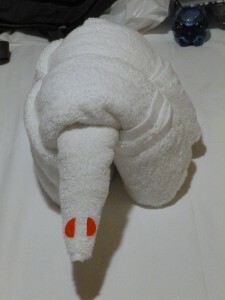 So I will be taking another day off work and I think I ought to get my family a hotel room just so they don’t have to be around my germs. I think Hubby was relieved to be going to work this morning. Anything to get out of the plague house. Here is hoping that your household has escaped whatever fall plague this is. You will never guess what I saw! Sometimes we feel like we live on heaven’s little half-acre, we see so many different types of wild animals on our property. And we don’t even have a half an acre, just 9000 square feet or so. A few days ago it cooled off again so the sunshine felt nice and warm, not too hot. Apparently something else thought the sunshine felt nice, too. As I walked from the driveway to my front door a movement caught my eye off to the right. It was a snake! The surprise snake was over two feet long and red in color, so we think it was a red racer. It decided it didn’t like me coming too close so it slithered off under the bushes in the planter. Everyone else in the family but me had seen at least one snake since we moved into this house a little over three years ago, so I was very excited to finally join the snake spotting club. And I got to see it up close and in all its snake-like slithering glory. I don’t mind snakes at all. The only poisonous snakes we have around here are rattlesnakes, so as long as there aren’t any rattles on the snake’s tail they don’t bother me a bit. Of course, there are a lot of people who feel differently about snakes. Given my choices, I would have rather seen a snake that was trying to get away from me as fast as possible than a racoon the size of my dog or larger standing its ground and having a vocal fit at me. I have had that happen. With the snake encounter I could just say “oh, cool” and get on with my life. If it had been a racoon I would have had to turn around and find another way into my house. Given the occasional rat problem we have I say there can’t be too many snakes in my yard!